I am excited about entertaining at your child's Birthday Party. We will have a great time! Over the years, I have been fortunate to perform at hundreds of Birthdays. Many parents have asked for my advice on how to host a successful party, and from those experiences, I would like to share with you some of my recommendations. The following are my secrets for the best Birthday Party for your child. I need an open space at the end of a room, about 4' x 6' wide, more if possible, preferably away from traffic areas and reflective surfaces like TV's, mirrors and sliding glass doors. Covering them with gift wrapping paper works wonders in protecting the magicians' secrets. Ideally, the kids should sit on the floor. The fewer obstacles between them and the show, the better. They are encouraged to laugh, shout, and have a good time. By the way, it's a good idea to put the glass centerpiece in a safe place. The most important thing to know is if the children are uncomfortable, the show will suffer. I highly recommend the show take place indoors. (In some cases, we even offer a discount for air conditioned / heated indoor environments). Direct sunlight, heat/cold, high winds, bugs, rain, etc., have ruined many shows. If you insist on an outdoor show, please make sure there is plenty of shade and shelter. A screened in porch or a garage would be an ideal outdoor setting. Over the years, I have performed at hundreds of birthdays under overwhelming conditions. Some locations are better then others. The important thing here is if there is too much going on, the show will suffer. See Diversions. Some places have a strict schedule that may cause us to cut the show short. They may have entertainment of their own, or may not even permit an outsider to come in and perform. They may even be so busy that it makes a show impossible. Check with the management. There may be a private room available specially for birthdays. Parks are great. Clean up is easy. Lots of room. However, if I cannot find you, I cannot perform for you! Hang balloons and signs that say your child's name". Also, be sure I get someone's cell phone number that will be at the party so they can talk me in, if I have trouble finding your group. Some parks won't allow you to reserve a shed ahead of time. Most are strictly on a first come - first serve bases. Find someone willing to go out to the park early and claim a spot by putting up decorations, and wait there until party time. Also check the weather forecast and prepare a contingency. See Outdoor Shows. A child's attention span varies with age, and their concentration can be sidetracked easily. You can help to make the most of their experience by KEEPING DISTRACTIONS TO A MINIMUM. Remember, this is live theater created just for your child. Music, TV, and background conversation should take place in another room. Please do NOT give the children food or drinks during the show. Their enthusiasm and your carpet will regret it. Pets who are part of the family should be in another room during set-up and the show. It is hard to compete with a cute cuddly pup! And a big dogs wagging tail can knock over props. (On a personal note, I am allergic to cats and would appreciate any consideration). Very young children will also get excited and want to join the fun by walking up to the magician during the show. A stray toddler will bring the show to a grinding halt until they are retrieved, so it is important to keep very young children with their parents. The show is as exciting for parents as well as children. However, Grown-Ups may tend to visit with friends they haven't seen in a while. Sometimes they get so boisterous the kids can't hear the magician. If the adults choose not to watch the show, please set up an area for them to visit. You might also consider having some organized play or games planned for when the children arrive. Those air filled bouncers work wonders. The perfect size party seems to be eight children, to keep you from pulling your hair out. If you do plan a larger party, be sure to have plenty of adult helpers on hand. Here's an idea, add our Airbrush Tattoos as guests arrive to keep the children entertained until show time. I like to arrive around 20 to 30 minutes before the show is scheduled to start. If you can reserve a parking spot near the entrance, it would be quicker to unload. It takes me about 15 to 30 minutes to set up depending on the package, and it's best if the children are playing outside or in another room getting their Airbrush Tattoos during this time. I usually begin by making YOUR CHILD a balloon hat with as many balloons as they are old. During the show, they get to assistant me, which makes them the star of the show. We also use your child's name as the “magic word” throughout the show. For the “Classic Birthday Party Package”, the magic show is 30 minutes long. After the show, each child receives a balloon creation made especially for them followed by handing out some promotional gifts. 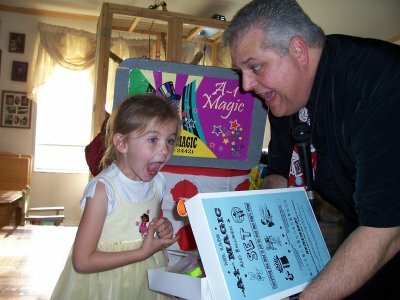 The "Deluxe Birthday Party Package”, magic show is 45 minutes long, including a special illusion with your child. See Restrictions. After the show, (time permitting & not necessarily in this order), each child receives a balloon creation made especially for them. Followed by handing out the optional "Magic Loot Bags" & the "Mr. Luis Magic Set or Instructional Magic Video" for your child. Then, I will guide the children into the cake area & lead them in the "Happy Birthday Song" while playing the harmonica. Magic is my full time occupation and I may be scheduled to do several shows a day. Some days my schedule is tight. That is why we ask that you invite everyone at least 30 minutes before the show is to begin so we can start on time. I would hate anyone to miss the show, or have to cut it short only because I have to leave to an other appointment. We want you to enjoy the party as much as the kids will. That is why it is important to get business out of the way first. If you can have the check ready for me when I arrive, I can keep to my schedule and not have to take you away from your child on the most exciting day of their life. That way, you can devote your time to taking pictures, cutting the cake & having fun with your child. For your convenience, we can now accept credit card payments. Ask for details. Due to the use of balloons and/or small toys, adequate adult supervision will be required at all birthday party packages. By the way, we encourage you to take plenty of pictures. This will be a very memorable experience for your child, especially when they are seemingly floating in mid air, or having their head disappear! Please note that the material I use is copyrighted. While still photography is encouraged, VIDEO PHOTOGRAPHY IS STRICTLY PROHIBITED with out prior permission of the performer, as per U.S. Copyright Laws. If you or any of your guests wish to video record the show or the audience, you may purchase the video rights to the show. Please ensure all of your guests with video cameras understand this policy. In addition, a magic show is best experienced live. Now, you can schedule to have us provide you with a professionally edited DVD of the Magic Show for an additional cost. At 11:30 - Games are played as the guests arrive. At 11:45 - Magician arrives & sets up. At 12:00 - Kids get Airbrush Tattoos. At 1:00 - Magic Show begins (Illusion). At 1:30 or 1:45 - Hand out Balloons, Promotional Gifts, Loot Bags, etc. At 1:45 or 2:15 - Cut the cake, Eat pizza, Open presents. At 2:00 or 2:30 - Parents arrive. Magician disappears. I hope these recommendations will help in planning for the most "Exciting & Memorable" Birthday Party your child will have on this very special day. Thank you for your consideration and I hope to see you soon. 4) Performed indoors or on a solid floor only. 5) Other illusions are available for older and taller children.